Fujifilm has introduced a range of new compactcameras in its J, Z and T ranges. The JZ200 and JZ100 both feature an 8x optical zoom lens in a compact body. The JZ200 features a 16 million pixel CCD sensor, while the JZ100 has a 14 million pixel CCD. Both the cameras offer a 25-250mm focal range (35mm equivalent), with a close-focusing range of 5m for shooting macro images that fill the frame. The LCD screen on the rear of the cameras has been redesigned for increased brightness in comparison to previous models in the J series. Scene Recognition Auto mode is designed to automatically assess the scene, selecting optimal settings to capture it. ISO sensitivity reaches up to 3200, designed for shooting in low-light. Face detection can capture up to nine faces in a single scene, making the compacts ideal for large groups or families. HD video recording in 720p is also available. The Finepix T400 is the latest in Fuji's entry-level long zoom compact cameras, with a 16 million pixel sensor and 10x optical zoom. ISO sensitivity stretches to 3200, again designed for better shooting in low light conditions. Other specs include Motion Panorama mode, Smile and Shoot and Blink Detection along with HD video shooting at 720p. 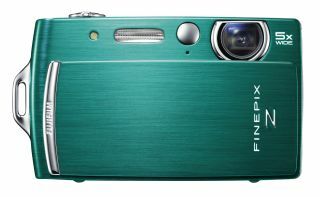 The Finepix Z110 is designed to be Fuji's "stylish" compact. It features a 14.1 million pixel CCD sensor, a 5x optical zoom lens and a series of other features. A Frame Assist Mirror, curved to show the entirety of a scene, assisting composition when the camera is held at arm's length for shooting a self-portrait is presumably designed for the Facebook generation. Other features along this line are Face Detection and the FinePix Face Retouching feature. "Night Out" mode has also been included, which includes Intelligent Flash technology to provide the correct amount of illumination with a maximum sensitivity of ISO 3200. Digital Image Stabilisation has also been built in. 720p video recording is also available. The Z1000EXR is also designed to fit in the "stylish" range, but features a set of more advanced technologies. Along with a 16 million pixel EXR CMOS sensor, the camera includes a Wireless Image Transfer function allowing users to connect Android or iOS smartphones and tablets to the camera to upload images to social networking sites. As with other EXR CMOS sensored cameras announced this week, it has been redesigned to reduce digital noise by 30%, claims Fuji. EXR Auto mode is also available to assess the amount of available light and establish the scene to apply Advanced Anti Blur technology. Full 1080p HD movie capture at a rate of 30fps along with Face Tracking Auto Focus is also available. Finally, the JX series sees two new compacts added. The "affordable" line now includes the 16 million pixel Finepix JX550 and 14 million pixel JX500. Both feature a 5x optical zoom. Other specs on the new cameras include 720p HD video recording at 30fps, Automatic Scene Recognition, Smile & Shooting and Blink Detection and Motion Panorama mode. None of the new compacts announced today have UK pricing and availability, but we will update as soon as this information is available.